Dogs crave a protein-rich diet. The way nature intended. 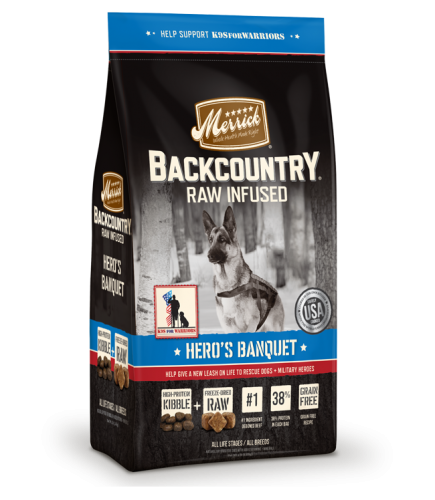 Merrick Backcountry is an all-natural, grain-free ancestral canine diet packed with protein that dogs crave. The Raw Infused kibble recipes deliver a perfect combination of protein-rich, grain-free kibble plus real, whole pieces of raw, freeze-dried meat. They provide your active dog the nutritional benefits of a raw diet they would have discovered in the wild, now in a safe and convenient recipe that's easy to serve. Puppies crave a protein-rich diet. The way nature intended. 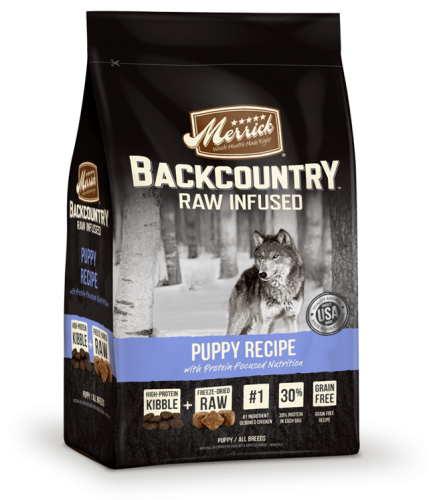 Merrick Backcountry is an all-natural, grain-free ancestral canine diet packed with protein that pups crave. The Raw Infused kibble recipes deliver a perfect combination of protein-rich, grain-free kibble plus real, whole pieces of raw, freeze-dried meat. They provide your active pup the nutritional benefits of a raw diet they would have discovered in the wild, now in a safe and convenient recipe that's easy to serve. This dish comes with everything but the sauerkraut, lederhosen and a liter of German lager. Merrick has set the table and left the rest to your imagination. Made with beef sausage links, sweet potatoes, carrots, green beans and granny smith apples, this recipe is sure to be a hit! Once upon a time there was a magical place called Wingaling, and it had the best tasting chicken in the world. 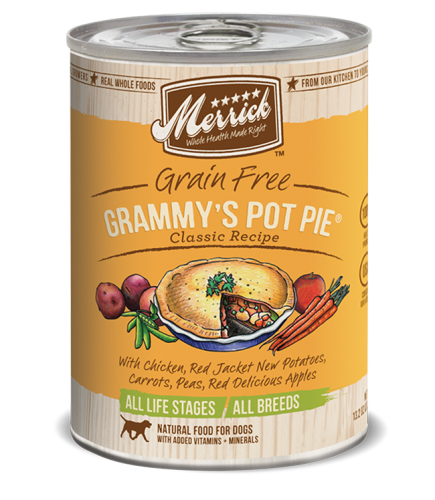 Merrick now brings your dog the wonderful flavors of chicken, sweet potatoes, carrots, peas and red delicious apples, right to his food bowl! The slow-cooked whole chicken wings offer marinated tender chicken cooked on a softened bone. The cooking process makes the bone mushy and safe for your dog to enjoy. Feel free to serve whole or to break apart the chicken and soft bones for ease of consumption. It's the Southern meal only your mom can make! 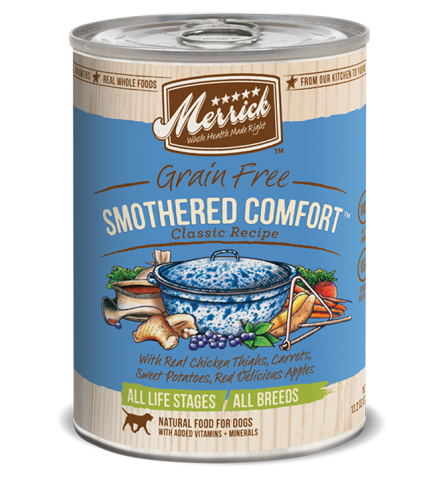 Merrick's Smothered Comfort delivers a delicious meal of real chicken thighs, carrots, sweet potatoes and red delicious apples that your pup will love! The house is filled with love and the wonderful smells of Thanksgiving infiltrate the air. Could it get any better as you fill your plate with juicy slices of turkey and all the trimmings? Merrick's Thanksgiving Day Dinner is prepared with turkey, sweet potatoes, carrots, green beans and Granny Smith apples. Bird is the word with Merrick's Turducken Recipe. Let your dog get in touch with his southern senses with this combination of turkey, duck, chicken, sweet potatoes, carrots, green beans and Granny Smith apples, all cooked together in wonderful juices that will make his mouth water! Gather around the table with your family and dogs for a cookout celebration! Your prized beef and favorite side dishes are ready to be feasted upon. 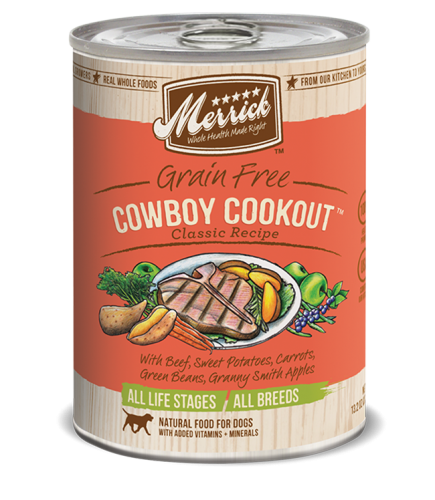 Cowboy Cookout is prepared with beef, sweet potatoes, carrots, green beans and Granny Smith apples for delcious, homestyle chunks that your dog will love. Hounds love the holidays! While Bruno probably doesn't like it when you put fuzzy reindeer antlers on top of his head, he'll definitely embrace the season with a bowl full of Merrick's Venison Holiday Stew. 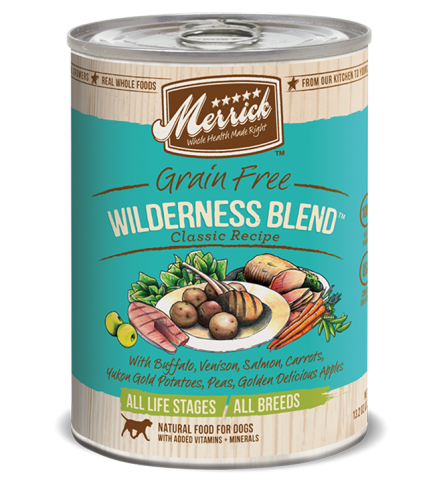 Full of venison, red jacket new potatoes, carrots, zucchini, peas and red delicious apples, this dish hits your pup's food bowl right from the stove! The wilderness - it's the call of the wild, the place where these flavors were first born. The bold taste of salmon, the untamed taste of venison and the original flavor of buffalo, all mixed together for an excursion of the palate. Merrick invites your dog to return to his first love - the wild! To help show our commitment to K9’s for Warriors, we are pleased to announce Hero’s Banquet is available all year long. 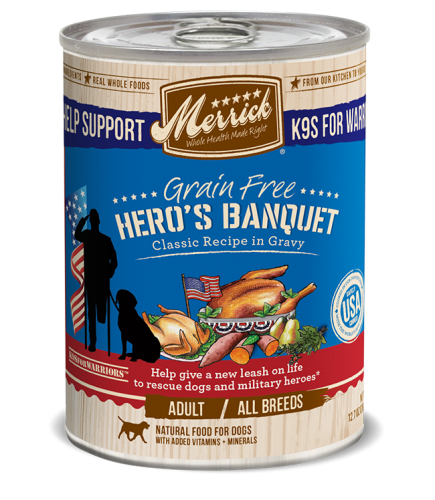 In addition to feeding these best service dogs ever, Merrick launched a limited-edition special can recipe of Merrick dog food, Hero’s Banquet, last fall, honoring American military veterans. The Hero’s banquet will now be available nationally year- round. Everything’s big in Texas, right? 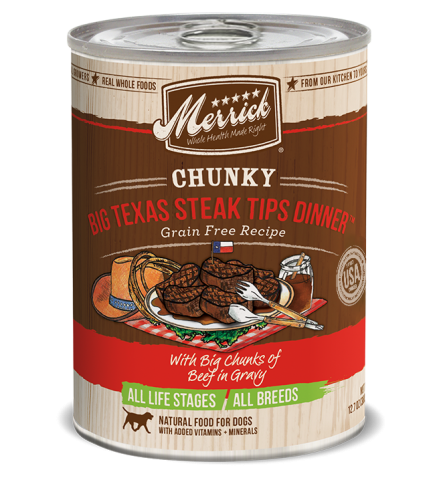 The biggest thing coming out of Texas now is Merrick's Grain-Free Chunky Big Texas Steak Tips Dinner. Made with big chunks of beef in gravy, this new Chunky flavor will make any mealtime special. Delicious, home style chunks that your dog will love. 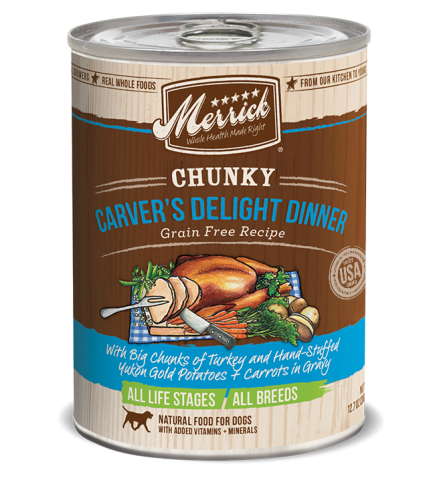 Delight your favorite pup with Merrick Grain-Free Chunky Carver's Delight Dinner. 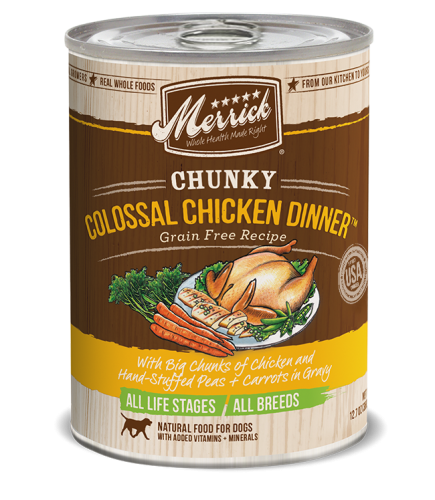 Made with big chunks of turkey and hand-stuffed Yukon gold potatoes and carrots in gravy, this new Chunky flavor will make any mealtime special. Delicious, home style chunks that your dog will love. Grammy is no longer single. 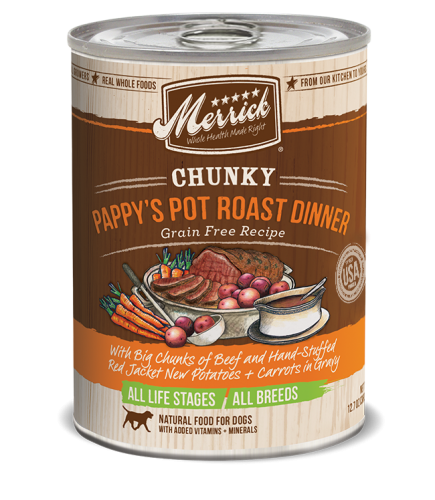 Merrick added Pappy’s Pot Roast to your cupboard to make the perfect couple of Merrick recipes your dogs will devour. Made with big chunks of beef and hand-stuffed red jacket new potatoes and carrots in gravy, this new Chunky flavor will make any mealtime special. Delicious, home style chunks that your dog will love. 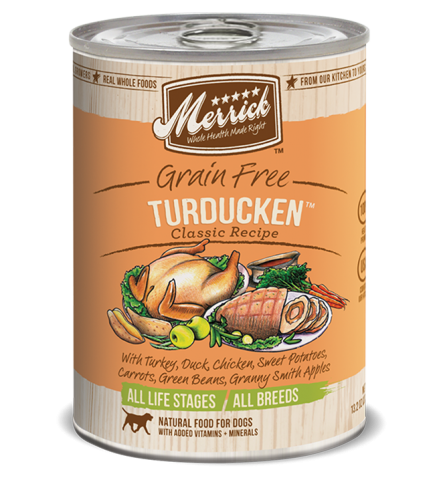 The grain-free seasonal cans from Merrick provide a great way to add some healthy variety to your pet's diet. Spring provides the perfect opportunity for Chicken, Spice + Everything Nice Canned Dog Food Made of chicken, lamb, peas carrots, and herbs in gravy, this dish will be sure to please your dog's appetite. 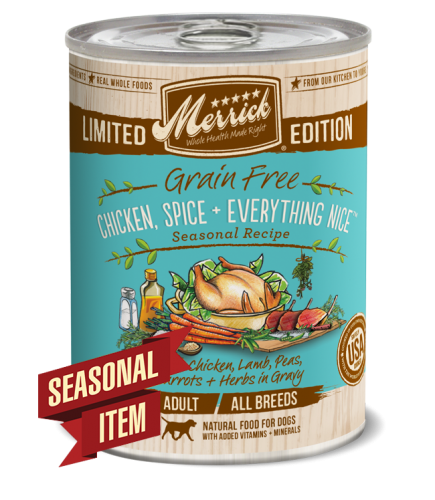 The Grain Free Chicken, Spice + Everything Nice Canned Dog Food is part of Merrick's seasonal canned food offering - get one before they're gone! 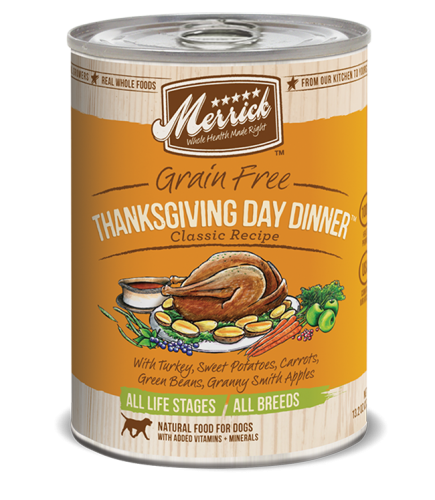 The grain-free seasonal cans from Merrick provide a great way to add some healthy variety to your pet's diet. Spring provides the perfect opportunity for a warm Sunday brunch and Merrick wants you to share that brunch with your best furry friend! Made of duck, cornish hen, sweet potatoes, and raspberries in gravy, this dish will be sure to please your dog's appetite. 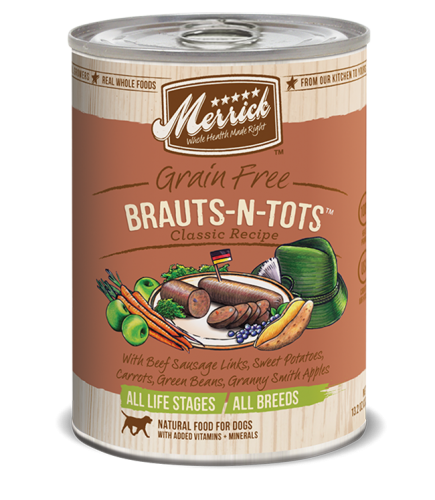 The Grain-Free Easter Brunch is part of Merrick's seasonal canned food offering - get one before they're gone! 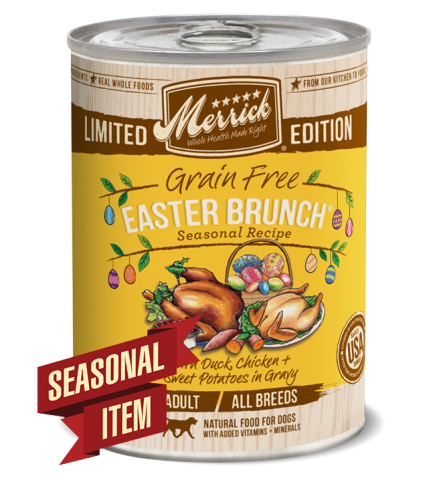 The Grain-Free Easter Brunch is part of Merrick's seasonal canned food offering - get one before they're gone! 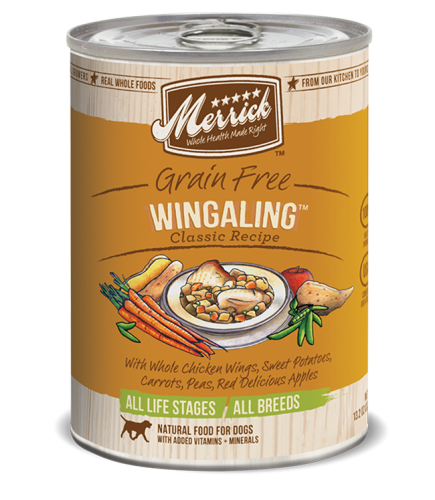 The grain-free seasonal cans from Merrick provide a great way to add some healthy variety to your pet's diet. Share this fun Irish dish with your favorite furry friend and wait for the smooches! Made of deboned beef, Yukon Gold potatoes, and carrots in gravy, this dish will be sure to please your dog's appetite. 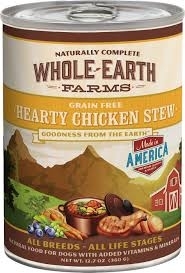 The Grain-Free Kiss Me I'm Irish Stew is part of Merrick's seasonal canned food offering - get one before they're gone! 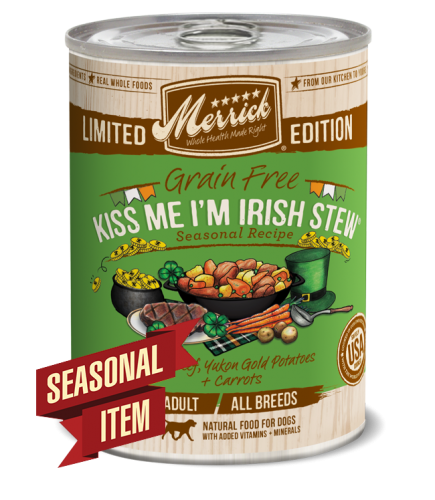 Kiss Me I'm Irish Stew is part of Merrick's seasonal canned food offering - get one before they're gone! 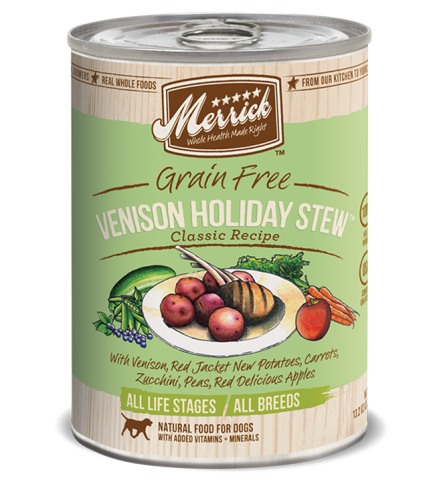 Celebrate the season with Merrick Seasonal Grain-Free Sweetheart Stew Canned Dog Food. This deliciously fun, limited edition blend is made with whole food ingredients, right here in Merrick’s USA kitchens. Chicken provides a boost of tasty protein, sweet potatoes and red apples provide antioxidant properties and large amounts of vitamins and herbs in gravy round out the festive, succulent taste. Merrick Seasonal Grain-Free Sweetheart Stew Canned Dog Food has added vitamins and minerals to provide a complete and balanced nutritional profile for adult dogs of all breeds. 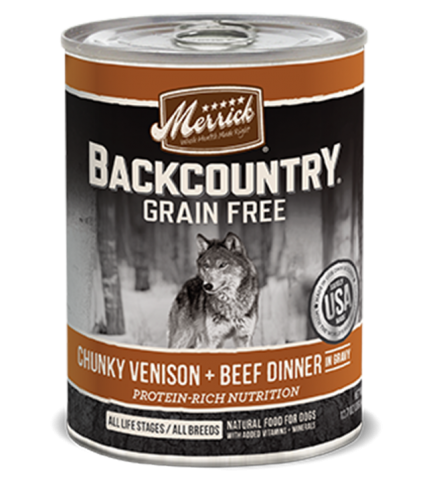 Merrick Backcountry gives your dog the meat-rich ancestral diet he craves with Grain-Free Chunky Venison & Beef Dinner in Gravy Canned Dog Food. Made in Merrick’s own Texas kitchens, this recipe adds moisture, flavor and protein variety to his bowl with large chunks of deboned meat and gravy in a hearty stew. It’s got all the protein dogs need and the taste they drool over with delicious venison, beef and lamb for balanced nutrition as nature intended.